In this article (geography section), we discuss the interior of the earth. Understanding the basic structure of earth is very important to learn higher concepts well. Also, the origin of many phenomena like earthquakes, volcanoes, tsunami etc are linked with the structure of earth’s interior. What should you understand about the interior of the earth? It is not possible to know about the earth’s interior by direct observations because of the huge size and the changing nature of its interior composition. It is an almost impossible distance for the humans to reach till the centre of the earth (The earth’s radius is 6,370 km). Through mining and drilling operations we have been able to observe the earth’s interior directly only up to a depth of few kilometers. The rapid increase in temperature below the earth’s surface is mainly responsible for setting a limit to direct observations inside the earth. But still, through some direct and indirect sources, the scientists have a fair idea about how the earth’s interior look like. By analyzing the rate of change of temperature and pressure from the surface towards the interior. Meteors, as they belong to the same type of materials earth is made of. Gravitation, which is greater near poles and less at the equator. Gravity anomaly, which is the change in gravity value according to the mass of material, gives us information about the materials in the earth’s interior. Seismic Waves: the shadow zones of body waves (Primary and secondary waves) give us information about the state of materials in the interior. Structure of earth’s interior is fundamentally divided into three layers – crust, mantle and core. It is the outermost solid part of the earth, normally about 8-40 kms thick. Nearly 1% of the earth’s volume and 0.5% of earth’s mass are made of the crust. The thickness of the crust under the oceanic and continental areas are different. Oceanic crust is thinner (about 5kms) as compared to the continental crust (about 30kms). Major constituent elements of crust are Silica (Si) and Aluminium (Al) and thus, it is often termed as SIAL (Sometimes SIAL is used to refer Lithosphere, which is the region comprising the crust and uppermost solid mantle, also). The mean density of the materials in the crust is 3g/cm3. The discontinuity between the hydrosphere and crust is termed as the Conrad Discontinuity. The portion of the interior beyond the crust is called as the mantle. 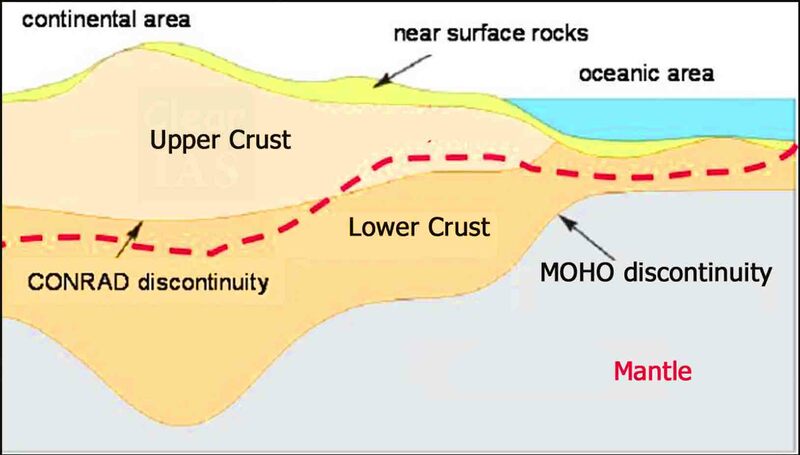 The discontinuity between the crust and mantle is called as the Mohorovich Discontinuity or Moho discontinuity. The mantle is about 2900kms in thickness. Nearly 84% of the earth’s volume and 67% of the earth’s mass is occupied by the mantle. The major constituent elements of the mantle are Silicon and Magnesium and hence it is also termed as SIMA. The density of the layer is higher than the crust and varies from 3.3 – 5.4g/cm3. The uppermost solid part of the mantle and the entire crust constitute the Lithosphere. The asthenosphere (in between 80-200km) is a highly viscous, mechanically weak and ductile, deforming region of the upper mantle which lies just below the lithosphere. 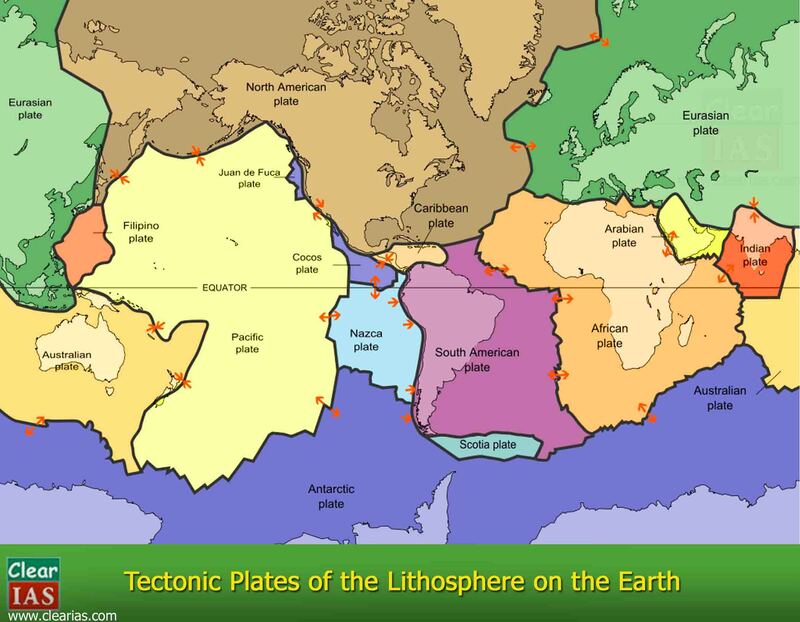 The asthenosphere is the main source of magma and it is the layer over which the lithospheric plates/ continental plates move (plate tectonics). The discontinuity between the upper mantle and the lower mantle is known as Repetti Discontinuity. The portion of the mantle which is just below the lithosphere and asthenosphere, but above the core is called as Mesosphere. It is the innermost layer surrounding the earth’s centre. The core is separated from the mantle by Guttenberg’s Discontinuity. It is composed mainly of iron (Fe) and nickel (Ni) and hence it is also called as NIFE. The core constitutes nearly 15% of earth’s volume and 32.5% of earth’s mass. The core is the densest layer of the earth with its density ranges between 9.5-14.5g/cm3. The Core consists of two sub-layers: the inner core and the outer core. The inner core is in solid state and the outer core is in the liquid state (or semi-liquid). 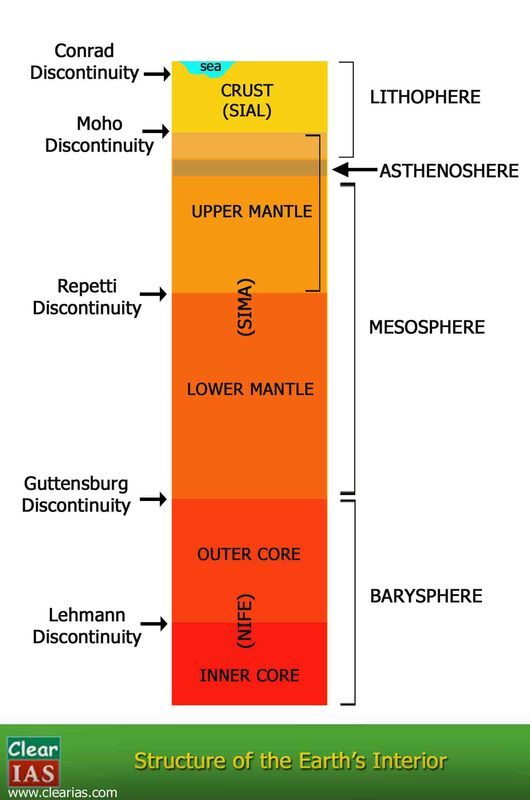 The discontinuity between the upper core and the lower core is called as Lehmann Discontinuity. Barysphere is sometimes used to refer the core of the earth or sometimes the whole interior. A rise in temperature with increase in depth is observed in mines and deep wells. These evidence along with molten lava erupted from the earth’s interior supports that the temperature increases towards the centre of the earth. The different observations show that the rate of increase of temperature is not uniform from the surface towards the earth’s centre. It is faster at some places and slower at other places. In the beginning, this rate of increase of temperature is at an average rate of 10C for every 32m increase in depth. While in the upper 100kms, the increase in temperature is at the rate of 120C per km and in the next 300kms, it is 200C per km. But going further deep, this rate reduces to mere 100C per km. Thus, it is assumed that the rate of increase of temperature beneath the surface is decreasing towards the centre (do not confuse rate of increase of temperature with increase of temperature. Temperature is always increasing from the earth’s surface towards the centre). The temperature at the centre is estimated to lie somewhere between 30000C and 50000C, may be that much higher due to the chemical reactions under high-pressure conditions. Even in such a high temperature also, the materials at the centre of the earth are in solid state because of the heavy pressure of the overlying materials. Just like the temperature, the pressure is also increasing from the surface towards the centre of the earth. It is due to the huge weight of the overlying materials like rocks. It is estimated that in the deeper portions, the pressure is tremendously high which will be nearly 3 to 4 million times more than the pressure of the atmosphere at sea level. At high temperature, the materials beneath will melt towards the centre part of the earth but due to heavy pressure, these molten materials acquire the properties of a solid and are probably in a plastic state. Due to increase in pressure and presence of heavier materials like Nickel and Iron towards the centre, the density of earth’s layers also gets on increasing towards the centre. The average density of the layers gets on increasing from crust to core and it is nearly 14.5g/cm3 at the very centre. sir plz say me in order that i will convince myself that after reading 9-12 ncerts …ramesh sigh ….gc leong……nitin singhania…..shankar ias…..vipin chandra or spectrum….my core syllablus will complete and no need to see ur notes as …..i have problem in vision …and cant use internet more. Well written in point wise. Thank you sir. Most of the aspects related to the topic covered point-wise and enable students to score good marks. Great effort. why it is important to study changes going around and inside earth crust? answer this question? Sir this note is very helpful to me.Please upload note on plate techtonic theory. I like It becouse This note gives by perfect knowledge Thank you fo that. What are the problems found in the upper mantle and the transition zone? ?